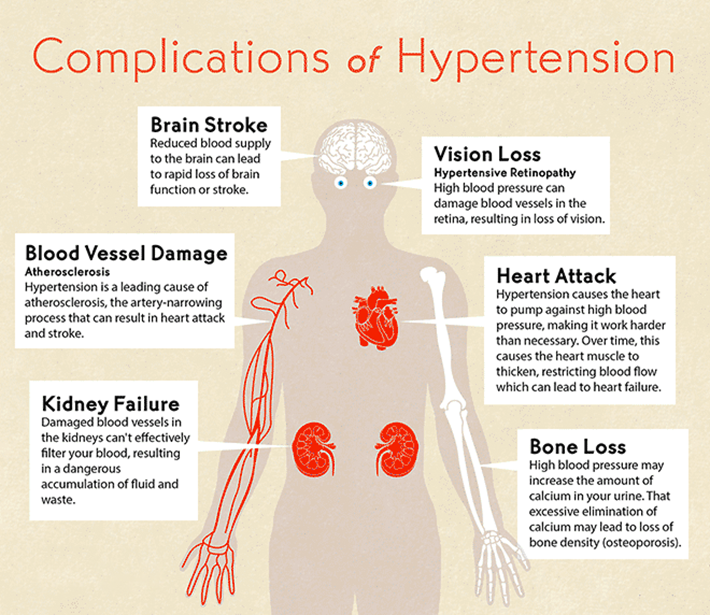 Hypertension or high blood pressure- you would have heard this term many times. High blood pressure has become very common nowadays. Elevated blood pressure is responsible for at least 45% of deaths due to heart disease and 51% of deaths due to stroke. Have you ever wondered why high blood pressure is so worrisome and How high blood pressure damages your body? The answer is because it puts pressure on the heart, arteries and other vital organs. That stress leads to serious health complications such as heart attack, stroke, paralysis and kidney damage. The normal blood pressure of a person should be 120/80mm Hg. Though an elevated level or reduced level, both are not regarded as healthy, the prevalence of high blood pressure is more. Blood is the liquid connective tissue which carries oxygen from the lungs to all parts of the body. The elevated level of blood damages several organs of our body like heart, brain, arteries, kidneys, eyes, and bone. There are various factors which are responsible for the elevated blood pressure like smoking, obesity, lack of physical activity, alcohol consumption, too much salt in the diet, adrenal or thyroid disorders. We can control our blood pressure by changing our lifestyle or by an alteration in our diet system. How high blood pressure damages your body? Arteries carry the blood from the heart to the rest of the body. The walls of arteries are smooth lined, strong, flexible and capable to push the blood. During hypertension, the extra pressure of the blood damages the cells of arteries. It causes the scratch in the linings of the artery wall, which leads to clogging. 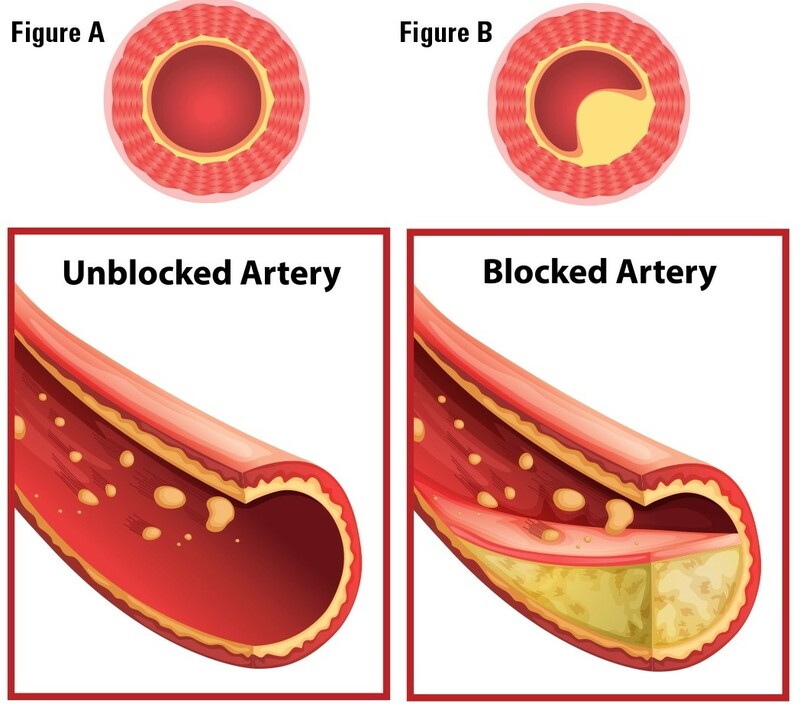 That clog and plaque blocks the arteries and hinders the blood flow. The heart is regarded as the vital organ of the body. It pumps blood to various organs via arteries and veins. The heart muscles also needs blood supply. Various heart complications occur due to improper supply of blood to the heart and cause chest pain (angina), heart attack (Cardiac arrest), and Irregular heartbeat (arrhythmia). When the blood gets stuck in the arteries, the heart needs to pump the blood with greater force. Due to overwork, the walls of the heart becomes larger and lose its strength to pump the blood resulting in heart attack. Stroke is the 2nd leading cause of death. Stroke is a condition wherein the supply of blood and oxygen to the brain is not decorous. 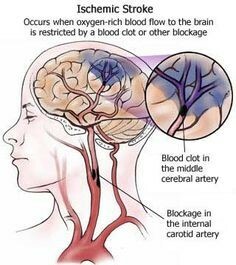 It is due to the rupture of a brain artery or blockage by the plaque of a blood clot. The brain controls the whole functions of the body. Different parts of the brain regulate the different body functions. The area of the brain deprived of blood would get affected the most. Sometimes it results in paralysis to lifetime. A lessened blood supply to the brain can also keep you from thinking clearly and remembering. It can provoke a condition called vascular dementia. Eyes are one of the most important parts of our body. 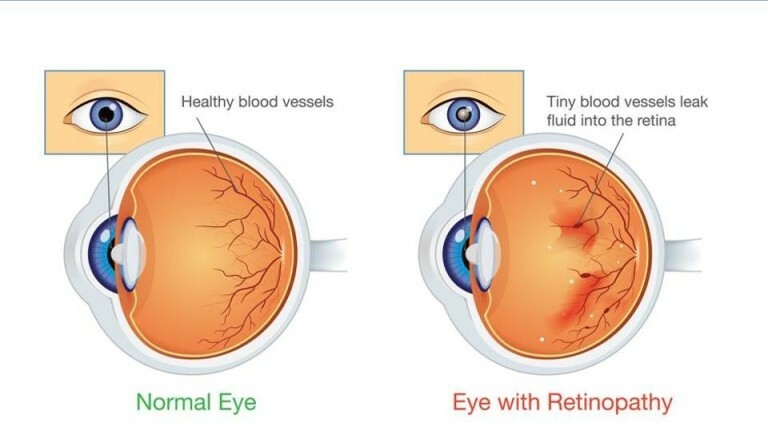 Elevated blood pressure can damage the vessels that supply blood to the retina and lead to retinopathy . In this condition problems like bleeding from eyes, blurred vision and complete loss of vision can occur. High blood pressure can also cause optic neuropathy or nerve damage. Nerve damage is a condition in which blocked blood flow damages the optic nerve. It can kill nerve cells in your eyes, which may cause bleeding within your eye or lead to vision loss. Sexual dysfunction: High blood pressure damages the linings of blood vessels that carry blood to the reproductive organs. The damaged linings make the vessels harden and narrow. The reduced blood flow towards the reproductive organs makes difficult for a male to maintain the erections. 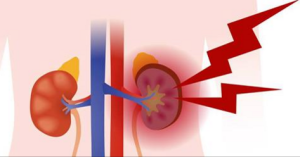 Bone loss: The excretion of calcium in urine is also the result of high blood pressure. 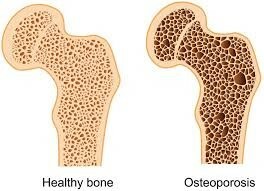 The immoderate elimination of calcium leads to loss of bone density, which in turn can lead to broken bones. The risk especially increases in older women. 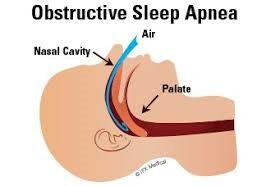 Sleep apnea: The sleep apnea is a kind of interrupted breathing while you are asleep. High blood pressure can trigger it or make it worse. Also, sleep deprivation resulting from sleep apnea can raise your blood pressure. 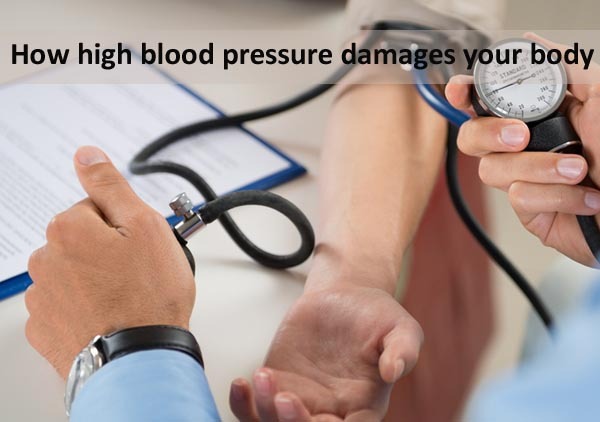 How high blood pressure damages your body? 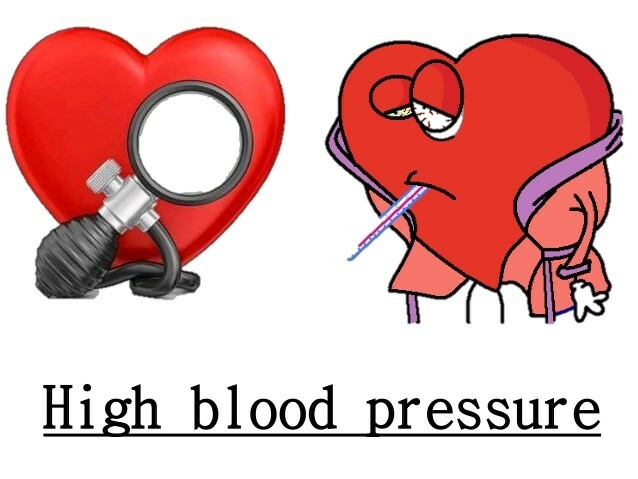 High blood pressure damage our body slowly over a long period of time without noticeable symptoms. That is why it is important to practice healthy habits, like regular exercise and eating a diet which is low in sugar, salt, and unhealthy fats. Blood pressure can be managed and being aware of your high blood pressure can help you and your doctor to control it better.